Even before I started a blog, I always enjoyed reading other blogger’s income and progress reports, dreaming of the day that I might succeed myself. Now I am so excited to share my own blog reports with you! I will tell you what worked, what didn’t, and share my best blogging tips so that you can learn from my successes and mistakes. Welcome to the Squirrels of a Feather September 2018 blog report. Why share a blog report? You might have read articles from bloggers who began blogging on a whim and one day woke up and realized that their blogging income had exceeded the income they earned from their full-time job. For years I have read income reports from my favorite bloggers and thought to myself, if only. I started Squirrels of a Feather, not only as a creative outlet to share exciting ideas and projects but also as a way to make money. I am no stranger to side hustling, and I wanted to build a successful blog that could eventually deliver a full-time income. I’m not there (yet) but I’m on my way! After all, blogging is a journey. Even bloggers that have “made it” have their own struggles. Chasing Foxes recently wrote that their revenue was cut in half when Google decided it no longer wanted to bid on ads for their site, as it viewed curated content (mostly roundups) as unoriginal content. There have also been several roundup-only sites that have been denied by MediaVine on the same basis recently. What you should take away from this information is to focus on creating your own unique content and work on growing your blog authentically, even if it means doing so slowly. 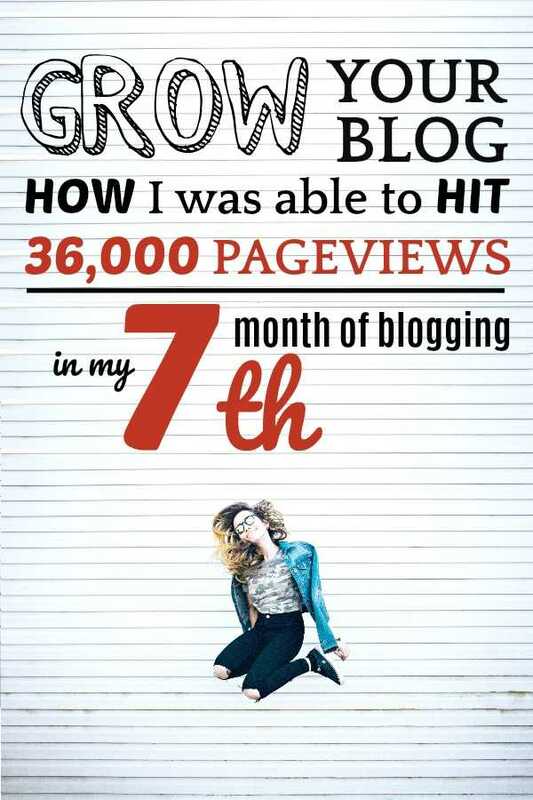 Update: read how I hit 140,000 pageviews in my eighth-month blogging — and why I’m still worried. My pageviews DOUBLED from August to September – 36,000 pageviews! I am beyond ecstatic that I was able to double my pageviews from August 2018 to September 2018! Take a look at the graph. 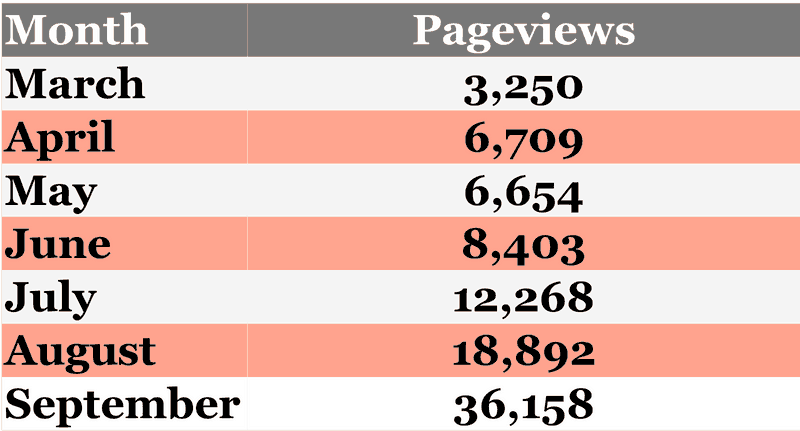 It’s a little tough to see the numbers on the chart, so here is a breakdown of the month-to-month growth in pageviews. As you can see, I had slower growth, in the beginning, followed by zero growth in May when Pinterest tried to kill me, followed by a large leap in pageviews, which has now doubled since last month! I ended September 2018 with 36,158 pageviews. As always, I am aiming for 100% transparency when it comes to the strategies that I use to grow my blog. All the strategies I recommend here I would (and do) recommend to my friends. If you haven’t started a blog yet, or you have but you are using a free platform, I would suggest switching to a self-hosted blog. A self-hosted blog gives you the most control and independence than a free hosting platform. For only a few dollars a month you can choose and upload any theme, customize it to your personal taste, and monetize much easier as compared to a free hosting platform. In fact, many free hosting platforms do not allow you to insert third-party advertisements or monetize with sponsored posts or affiliate ads. Want to test the waters and see if you have what it takes to succeed? Go with the hosting company that I started out with! Not only does Bluehost offer excellent hosting and tech support, but they are also risk-free! If you decide blogging is not for you or grow to the point that you need to switch to a different hosting platform, Bluehost will refund you for the unused months of your package. You can start a blog today with Bluehost for this special low-price offer of $3.95/month. Do yourself a favor and get a great blogging resource. Starting a blog without a guide is like trying to climb to the top of Mount Everest in only your underwear and flip-flops. If you don’t get a blogging guide, I guarantee you are going to be “that guy” asking a billion questions in FB blogging groups and waiting for someone to HOPEFULLY answer all your questions one by one. It’s the height of inefficiency. Time is money and if you don’t want to waste either, do yourself a favor and invest in a good blogging resource that will teach you all the things, from how to set up your blog to monetizing. But hey, don’t listen to me! Listen to Abby, who as of her final published income report in September 2016 was making 40k+ per month from her blog (it’s probably way more now). 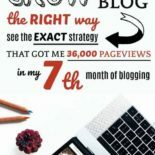 Abby’s Building a Framework: The Ultimate Blogging Handbook is the resource I used to literally build my blog from the ground up. I HIGHLY recommend it for newer bloggers who don’t know a widget from a plugin. *Update: Abby is closing her BaF course, unfortunately. If you are looking for a complete blogging course I recommend this one, which is helping me immensely. In my last blog report, I noted that I wasn’t seeing enough ROI (return on interest) focusing on Facebook and Instagram, so I was going to reduce my time spent on those platforms in favor of Pinterest and Google. Happily, that strategy seems to have paid off! The two programs that I use are Tailwind and Tasty Pins. I can’t stop raving about these apps because I love them so much! These two babies can make your life soooo much easier. Here is what they do. Tailwind is a scheduling app that allows you to schedule your pins to rotate out on Pinterest at different times throughout the day, so that you don’t have to constantly glued to your phone or desktop pinning mindlessly. You literally set it and forget it! Best of all, this program is super smart! Not only does it suggest the best times for you to pin by creating a Smart Schedule based on the times that your audience is engaged and pinning on Pinterest, it also gives you access to all sorts of data, like which pins are the most popular, repin counts, how well your various boards are performing, etc. Now, Tailwind is great for Pinterest but it is no help when it comes to optimizing for Google and organic search traffic. That’s where Tasty Pins comes in. Tasty Pins is a nifty little program that helps you optimize for Google AND Pinterest searches simultaneously — it’s my secret weapon for getting my blog in the top searches on Google and Pinterest time and time again! Hide Pinterest-specific images with a click of a button — no coding required! The 4 SEO Strategies That Increased My Organic Traffic 588%! When you are a small blogger, each success is measured and celebrated — as it should be! Here are some of the other successes I had in September. I am excited to FINALLY announce that I was accepted as part of the Creative Team at Kenarry! In fact, my first post for Kenarry just went live! Not only do I get to learn from and work with the other awesome Kenarry Creative Team members (and get paid to do so), but my blog will also benefit from backlinks from Kenarry, which helps increase my domain authority. Score, score, and score some more! I stuck to my special formula for creating viral pins and this month I got multiple hits when several of my Halloween posts went viral! One of my posts got pinned over 30,000 times alone! If all goes well, hopefully, you will be seeing some sponsored content here soon! I doubled my pageviews from August to September! Does that mean that my income also doubled? In truth, because I have been more focused on increasing traffic and pageviews than on income, I wasn’t putting much emphasis on monetization. I also wasn’t good about tracking my income for the first six months, so I just quickly calculated that in the first six months of blogging I earned a total of $324 — that is from affiliate income and ad income combined. I know, you have to pick your jaw up off the floor after seeing those staggering numbers. This is what REAL growth looks like, guys! Given that in my blog’s entire first six months I made a total of $324, I would say that $130.30 in one month is a step up! I am definitely not making anywhere close to what my blogging idols are making, but I get tickled every time I log into my accounts and see even $1 new there! I have a feeling that October will be even better, but it’s hard to predict where it will land. Why have I been focused more on pageviews that monetization? I have been aiming to qualify for MediaVine so I can increase my ad income. As MediaVine requires 25k sessions per month, I was working on hitting that number. I am pleased to say that I did reach my goal and applied for MediaVine (fingers crossed). Clearly stating your goals and strategies is a key way to guide yourself to success. Here are the exact strategies I plan to employ to continue to grow my blog. Posting – Continue to create quality content 2x/week and use Pinterest and SEO to drive traffic. Email — I need to get better about growing my email list. I am not tech savvy AT ALL and so trying to create and embed snappy email subscription boxes in strategic places is not my forte. I am going to be working on this for October, lord help me! Instagram – Post only twice on Instagram each week when I release a new post, but continue to update my stories daily. Stories — so hot right now. Facebook – Share every once in a while when something strikes my fancy. Will not post 5x/day anymore. Twitter – Meh. That is pretty much my strategy. Photography – Continue to try and improve my photos. Brands – Work in progress. Wish me luck…feel free to check out my media kit if you need some inspiration! Feel free to leave any comments or questions below and I will try to answer them! Let’s try and build money-making blogs together, shall we? We were really disheartened when the folks behind Chasing Foxes received that penalty from the ad buyers and did what we could to mitigate it. Unfortunately, we’ve come to know that advertisers, in general, really only see the value in original, authentic, unique content – which is kinda the same as readers, so it makes a lot of sense. I’m grateful that you’re out here giving that advice, because it can be critical to how someone approaches their business and growth. Hoping you’re part of our Mediavine family soon! Wow, thanks so much for visiting and the excellent feedback, Amber! (I feel like a celebrity just commented on my blog.) 🙂 It was really shocking to read that Chasing Foxes experienced that, I know that they put a lot of time and effort into curating content and have a really solid blogging strategy. I am sure they are going to bounce back soon! I also am hoping that I will become part of the MediaVine family soon — put in the good word for me if possible, *wink wink*. That’s been a big goal for me ever since we chatted at Haven, and reaching that threshold was a definite “moment” for me. Cheers! Marissa thanks so much for sharing this valuable information. I really appreciate your honesty as well as the blogging tips. I have not doubt that your blog will be a success. You should start applying to Mediavine soon! Adsense is terrible 🙂 Mediavine isn’t strict about their session count, as long as it’s close (like 20k sessions) you can get in! Yay Lily, so nice to see you here. <3 I did reach the threshold (about a week ago) and applied right away. You are so right about Adsense...today I am above 2,500 p/v and have a STAGGERING total of $1.46. Wish me luck, hoping to hear back from MV soon. Hey Marissa! You are such an inspiration. I am glad to see your continued growth. I do have a question — is there a reason you track pageviews rather than sessions? I know most of the big ad networks go with sessions so that’s what I have been keeping my eye on. I look forward to hearing your input! I hope you make it to Mediavine status soon. Sara, you are too sweet…I am sure your blog will be there soon! I track pageviews because in general that is what most other bloggers I follow have also shared in their reports. I thought MediaVine was the only ad company who looked at sessions rather than pageviews, but feel free to correct me if I am wrong! I think you need 100k p/v for Adthrive. Thanks, I hope you make it soon too! Oh that may true. I have only looked further into mediavine because it seems to be such a closer step than Adthrive. Girl, I always learn something new from you when I read these posts! Congrats on your viral Halloween eyeball and having brands reach out to you now too! That’s so awesome. Great post, as always, dear heart! I’m so excited you have been able to apply for MV, and for the visit from Amber! WOW!!!! 😉 Praying for your continued success! Such a great post, Marissa! I really need to get on Tailwind, I had dabbled in it a little a few months ago and then got busy and I haven’t been back to look into it more. I also need to check out that Tasty Pins site! I haven’t even heard of it, but it sounds very useful. I really could work more on my SEO. I just feel that I’m in this hamster wheel of getting posts written, visiting other blogs, etc. that I don’t have time to do a lot of research. You seem like you got that done, though!! Congrats! And, that edible eyeball post was just AH-mazing (eye) balls! I love your writing style and business approach. I am sure higher numbers are around the corner if you continue in the same spirit. Thank you so much, Iryna! I sure hope I can keep growing and get up there! Cheers. Such a great post, Marissa! So excited for your growth and success. You are an inspiration! Thanks, Lynne, I am excited too. I hope I can keep it up! Cheers. Aw thanks so much, Jen! I will be looking forward to seeing more from you in the future…like acorn corbels?! Really excited that your industry, creativity, intelligence and personality are being admired by so many. Am sure it will only continue to grow your fanbase. ooh…a fellow How I Met Your Mother Fan! Wow!! I had no idea that happened to Chasing Foxes. That’s a bummer, but they are so smart and will figure out something new in the meantime. Congrats on your accomplishments. It’s great to see you grow so much. Exactly, they were smart enough to build up what they have and now they have the experience, money, and readership to make it EVEN BETTER. It’s great they were candid enough to share their real experience with their audience, we can really appreciate and learn from them. Congratulations, Marissa!! (I’m a little late to the party on this post 😉 I always enjoy reading your posts, thanks for sharing what’s working for you, and what you’ve learned! Congrats again on all of your hard work paying off! Hey Marissa, Thanks for sharing this wonderful blog. Thanks, Pravesh! I always like to think hard work pays off. Marissa! I’ve been busy and didn’t check in in a while but YAYYYYYYYYYY I’m so excited for you! Thanks so much — I totally know what you mean, Amanda! It’s been so busy with holiday stuff lately, I need to check out your stuff too. Have a GREAT Halloween! Congrats on an amazing month! I started my blog at the same time and am no where near where you are in terms of traffic! You’re killing it!! 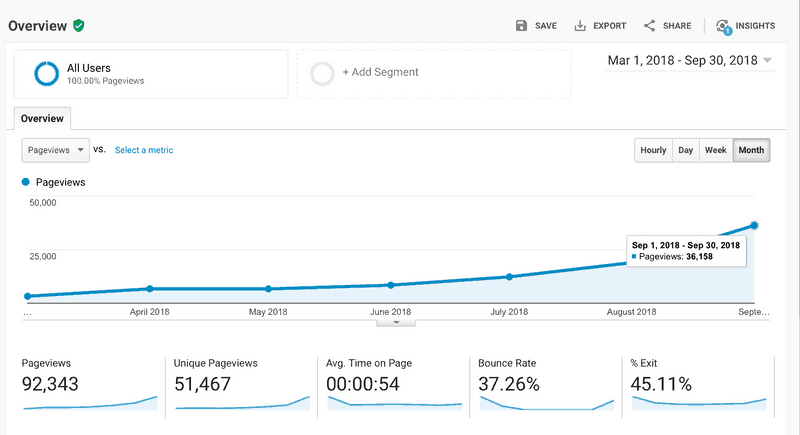 I think blogging is a combination of hard work, patience, and a LOT of luck…at least until people decide they like you and keep showing up month after month. 😉 Keep it up, I am going to go check out your blog! Thanks for stopping by, Janet. Girl, you’re killing it! Less than a year into blogging and you have hit Mediavine status and making a small income. That is fantastic. I just know you’ll continue to grow and increase your pageviews and income. I am still slowly chugging away at this blogging thing but am excited to share my first blogging report soon! Thanks so much, Sara! I can’t wait to see your blogging report, let me know when I can look for it!